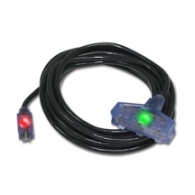 Lighted connectors show when cable is energized. 12-Gauge, 3-Conductor, grounded extension cords. Molded Edison connectors for durability. Female connector has ground continuity indicator.